It’s back to school this week and the art room at IMS has a new look! Because it is our last year at the Tin Hau campus, I figured I would honour the space with giving it some tender loving care before we kick off this final year. 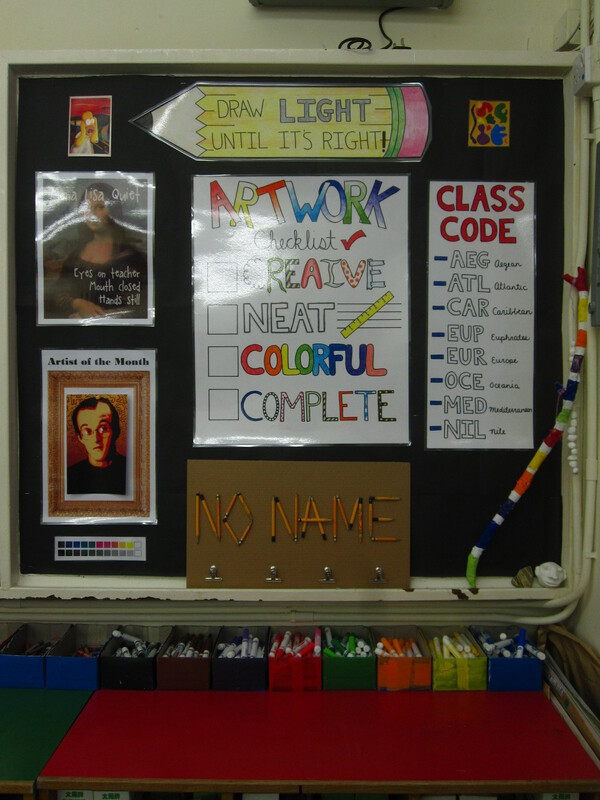 From an art chart to repurposing an old school house to teach art class, I am thrilled to finally have my own classroom. Well, my classroom was never meant to be an art room but it has a sink which presents a watery world of possibilities. Last year, I spent a lot of time sorting through years worth of hoarded art materials, cardboard scraps and unidentifiables. Thankful that the previous teacher collected so much stuff for me, I saved about half it and spent the rest of my time finding an effective way to store and access our supplies. Now with that done, a year later, I can focus on beautifying! For starters, I created some signage of the quotes I say all the time, which will save me time and breathe. Such as “draw light, until it’s right” and “hair up, handle down”. I also sewed bunting with some newly found fabric and created a Mondrian inspired pattern on the art room doors using electrical tape and laminated tissue paper. Most of these ideas I found and/or stole from Pinterest (praise to the Pinterest Gods). 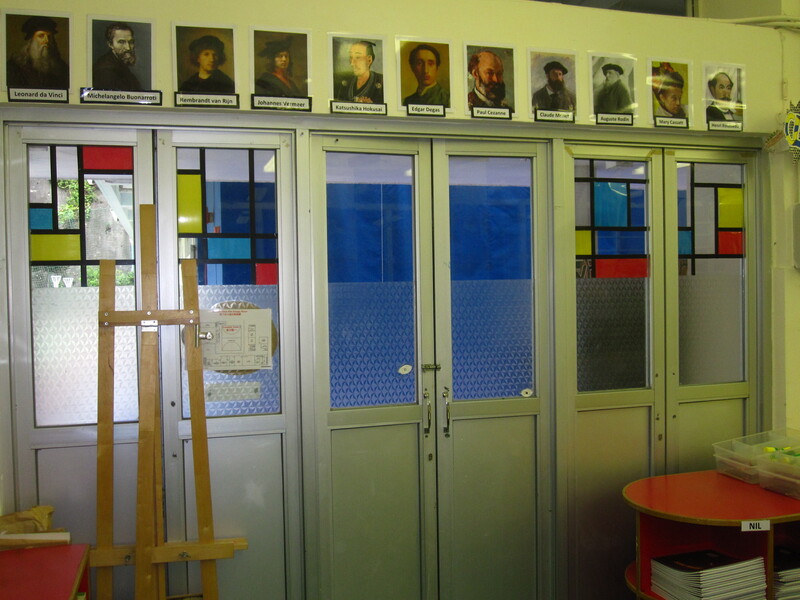 Lastly, I will add more artists to the artist timeline which acts as a border around the room. Students love looking at the artists’ pictures, and whenever I reference an artist they are quick to try and find them on the timeline. 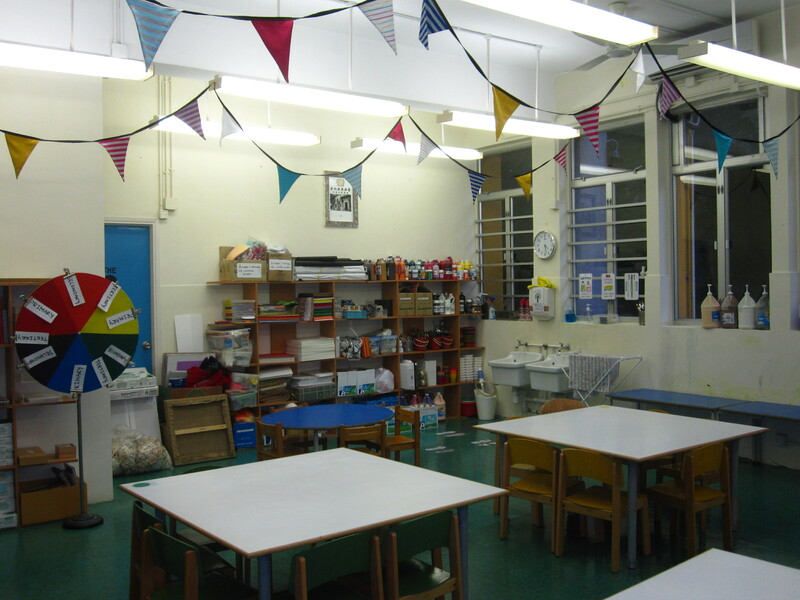 With the art room acting as inspiration, I look forward to what my students will create this year in our tiny Tin Hau art room.